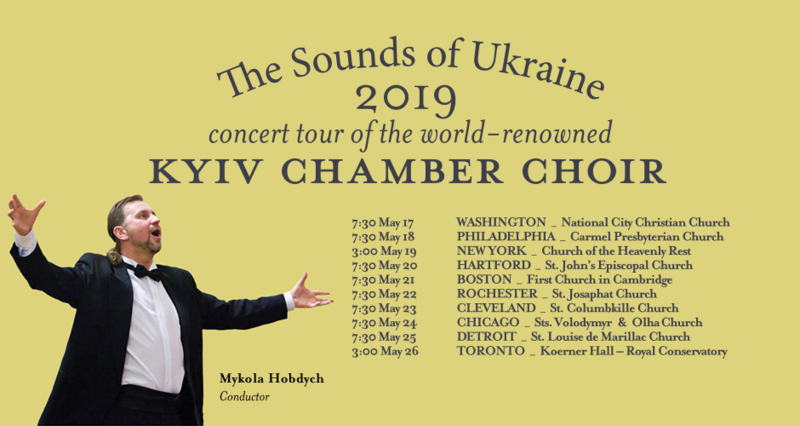 Conductor Mykola Hobdych and the world-renowned Kyiv Chamber Choir return to North America in May of 2019, for concerts in high quality musical venues in both the United States and Canada. They will perform in New York, Chicago, Washington, Philadelphia, Boston, Cleveland, Hartford, Detroit and Rochester as well as in Toronto. The first half of each concert features choral works by the ‘masters’ – the best composers in a rich history of outstanding Ukrainian choral music that dates back over 1,000 years. These classic sacred songs are performed with great skill and passion by this award-winning Choir. The second half of each concert features popular, beloved Ukrainian folk songs, arranged by the finest contemporary choral composers. The Choir’s dynamic presentation features costumes, instruments and choreography, as well as their outstanding singing – and is unlike anything else in the world of music today. People of Ukrainian heritage will hear some of their all-time favourites – sung with great quality and presented in a unique and entertaining way that creates a powerful concert experience not likely to be forgotten. For many other people, the outstanding choral music of Ukraine is not heard as often as its quality merits. The beloved “Carol of the Bells” may be the only Ukrainian song with which many people are immediately familiar. The Sounds of Ukraine will bring the ‘hidden treasure’ of Ukrainian music to every person in each concert venue. Kyiv Chamber Choir performances always bring audiences to their feet and make each of their entertaining concerts a special occasion – one not to be missed.